Many health-conscious people today are turning to the natural world for health benefits. Every year, some new “super food” is discovered. One of the latest discoveries is the lychee fruit, and this one isn’t just hype! Lychee, or properly Litchi chinensis, is a tropical plant that’s native to parts of Thailand, India, China, Taiwan, the Philippines, and Indonesia. 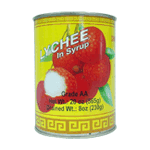 Lychee is actually a member of the soapberry family. The fruits from the lychee tree are rather unusual looking. They somewhat resemble a bumpy leather strawberry. When this leather jacket is removed, however, the delicious flesh of the lychee fruit is uncovered. Product of Thailand.